Several trucking associations, businesses and fleets have pledged support this holiday season for Wreaths Across America, a non-profit organization that lays wreaths on the graves of veterans at locations around the nation. A wreath-laying ceremony is set to take place on Dec. 12 at Arlington National Cemetery. The trucking industry is supporting the effort by transporting wreaths and donating time and money to honor our nation’s veterans. American Trucking Associations’ Share the Road truck will once again deliver handmade wreaths to Arlington National Cemetery for Wreaths Across America. The truck is being driven from Maine to Arlington by Share the Road truck drivers Eddie Hosegood and Jerry Charron of XPO Logistics. "The cargo we are hauling this week is the most precious cargo, to me," said Hosegood. "I am honored to get the chance to volunteer for this trip and show my support for the fallen soldiers who have made the ultimate sacrifice." The Share the Road truck will be traveling as part of a procession of dozens of trucks from several carriers carrying wreaths to Arlington. 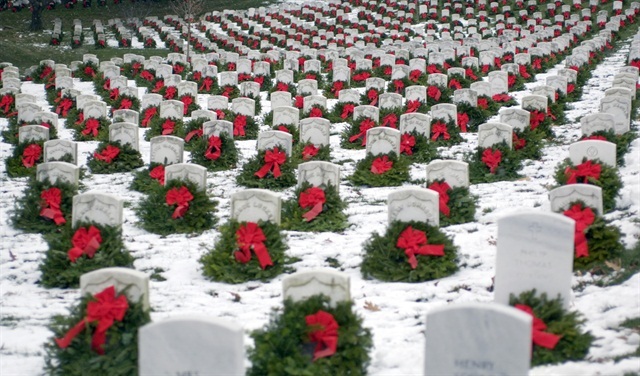 In addition to Arlington, over 900 veterans’ cemeteries this holiday season will receive more than 500,000 wreaths. The Truckload Carriers Association is once again coordinating the convoy of trucks participating in Wreaths Across America with its Truckloads of Respect program. Fleet management solutions company Omnitracs has pledged $25,000 to Wreaths Across America for the sixth consecutive year bringing the company’s total donations to the cause to $150,000 since 2010. TravelCenters of America announced it will also participate by working with the TCA’s Truckloads of Respect program to coordinate the annual wreath-laying ceremony. TA’s in-house distribution group will be among the many to participate in the pickup and delivery, starting in Harrington, Maine. Over 1000 locations around the U.S. will be hosting wreath-laying events at which truckers, fleets and trucking organizations can participate in the charity's work, according to Wreaths Across America. You can find a location and fundraising group near you with a tool on the organization's website.